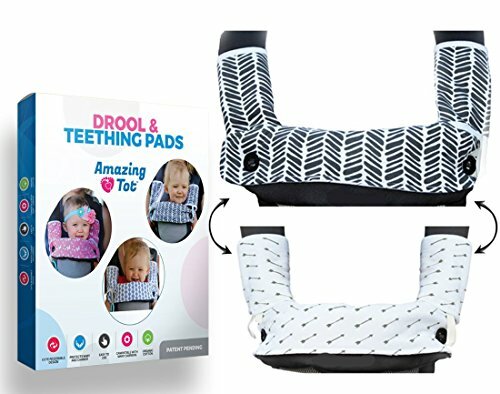 PROTECTS YOUR INFANT & CARRIER (Carrier Not included): Our HIGH ABSORBENT Patent Pending Drool Pads Set (3 Piece) keep your baby dry preventing the rashes and are a perfect solution to protect your expensive carrier from baby drool or spit up. REVERSIBLE ORGANIC COTTON: Each pad is made of soft, thick and natural organic cotton with a reinforced stitching. The stylish reversible design sure will up your fashion. FITS ERGOBABY & OTHER CARRIERS: Designed for ERGObaby Four Position 360 Carrier, but also fits other carrier, car seat & stroller straps like Chicco, Lillebaby, Beco, Jeep, Boba, Babybjorn, Infantino, Tula, Evenflo & many more. 100% MONEY BACK GUARANTEE: We guarantee that you will love our product. For any reason if you are not satisfied, you get refund. Purchase with peace of mind!